It consists of well-defined structures, such as endoplasmic reticulum, mitochondria, plastids. Golgi apparatus, vacuoles, and liesicles. Cytornembrane system is composed of biological membranes. These membranes consist of double layer of phospholipids. Cytomembrane system divides the cell into different compartments. It increases the surface area of cytoplasm. The compartments of Cytomembrane system are directly involved in most of the metabolic reaction. Each compartment has different chemical and physical environment for carrying out different functions. For example, many respiratory enzymes are embedded in mitochondria. microtubules, micron laments and intermediate filaments. Microtubules are long, unbranched and slender structure. They are composed of protein tubulin. 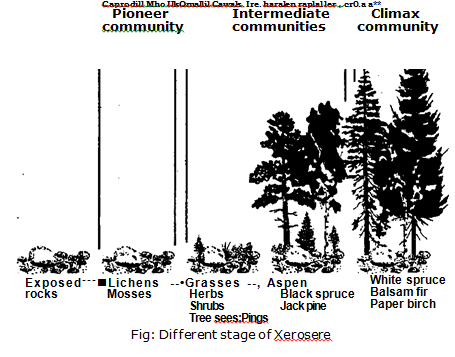 Microfilaments are comparatively more slender. They have cylindrical shape. They are made up of contractile protein actin. Intermediate filaments have diameter in between tnicrotubules and micro filaments. Granular structures Cytoplasm also contains a large number of granular structures. Ribosomes are also granular structures present in cytoplasm. They are involved in protein synthesis. It also contains insoluble inclusions like insoluble waste and storage products. (a) True solution: –File small molecules and ions form true solution. The molecules present in the form of true solution are glucose, some amino acids, soluble salts, ions etc. (b) Colloidal solution: Some large molecules form colloidal solution. Colloidal solution is present in two forms. (a)Sol: Non-viscous colloidal solution is called sol. It is present in liquid form. (b) Gel: The viscous colloidal solution is called gel. It is present in the form of semi-solid. The peripheral part of cell is often like a gel. Cytoplasm has unique physical properties. Cytoplasm is mixture of sol and gel component. It cal, flow like a sol. But gel offers resistance in its flow. The eytosol is gel like near outer membrane. But it is non-viscous or sol Ii .e in the interior end. Cytoplasm shows streaming and cyclic movements due to this property. Cytoplasm has almost neutral pH. Mos* of salts are present in ionic form in cytoplasm. It acts as storage house. 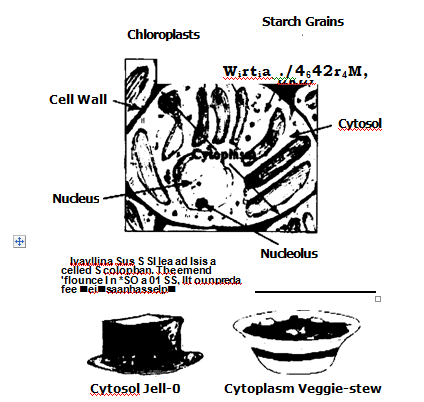 Most of important compounds like starch are stored in the cytoplasm. Some metabolic processes like glycolysis (breaking of glucose) take place in the cytoplasm. The cytoplasm contains several cell organs like mitochondria. Golgi bodies. endoplasmic reticulum, lysosomes etc. These cell organelles perform many important functions of the cells. Cytoplasm shows streaming movements. Streaming movement is an active mass movement of cytoplasm. Many free floating organelles like mitochondria move in the cytoplasm due to these streaming movements. 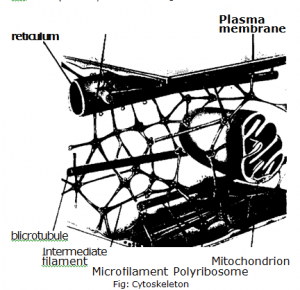 The cytoskeleton of cytoplasm gives support to cell. It also helps in internal cell movement.